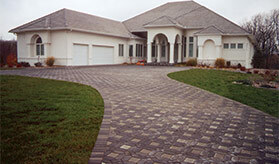 Pavers are a popular alternative to poured concrete when it comes to hardscaping and landscaping. Pavers offer virtually unlimited design options, are affordable, and last for decades. The uses for pavers are seemingly endless. 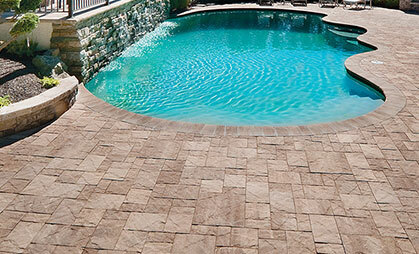 Pavers are perfect for use in walkways, driveways, patios, pool decks, entrances, courtyards, outdoor kitchens, outdoor fireplaces and fire pits and edging. While brick pavers and concrete pavers are the most common, pavers are available from a variety of other materials, including stone, slate, granite, and more. Pavers are an excellent alternative to poured concrete. Pavers offer three times the strength of concrete slabs. Their superior durability allows pavers to stand up well to heavy traffic and harsh weather, as well as deicing agents and shoveling. And pavers have a rough surface that is naturally slip resistant. Pavers won’t crack like concrete and will last 30 years or more. If a paver does become damaged, making repairs is as simple as pulling out the damaged paver and replacing it with a new one. Pavers are easy to install, making them ieeal for do-it-yourselfers. Pavers can be set on poured concrete, or they can be set on compacted crusher run. 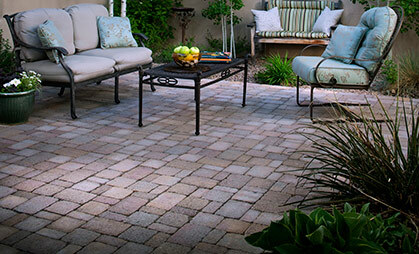 Unlike poured concrete, which can require several days to cure, a surface constructed from pavers, such as paver patio or a paver walkway, can be used as soon as the pavers are set. A sealer is recommended to help prevent grass from growing between the pavers and helps keep them clean. 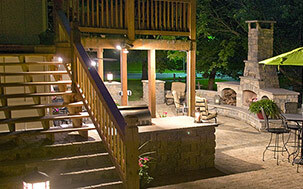 Visit Stone Solutions to see our extensive selection of pavers. 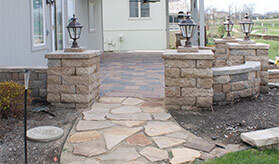 Our hardscaping experts will help you find the perfect pavers for your hardscaping project. Available Colors: Merriam Blend, Ozark Blend, Winter Blend. The tumbled Vintage Stone® product mixture delivers scale, color and modular design options for a unique paver expression. The truly random pattern of Vintage Stone® expands an infinite number of impression possibilities making it one of the most popular design tools for pavements today. Available Colors: Ozark Blend, Hearthstone, Winter Blend, Merriam Blend. 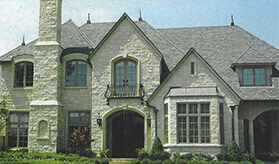 The Venetian Stone™ uniquely attractive cleft surface sets it apart from other pavement treatments. 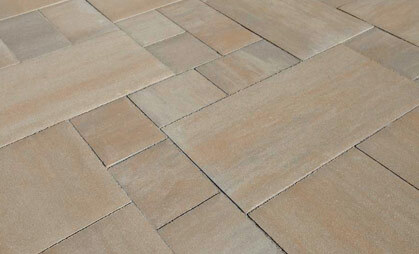 The texture of this paver combo resembles old world charm and invokes a traditional convention. The larger scale of the Venetian Stone™ paver lends itself to stately residential settings and more expansive commercial applications. The Venetian Flag creates dramatic and dynamic interaction with sunlight through its cleft and chamferless surfaces, which evoke the timeless appeal of split flagstone. Far easier to install than competing products, Venetian Flag self-terminates on a 2 foot grid - both inside and outside corners are formed with no cuts. Venetian Flag can also form a 4 foot wide walkway with no cuts, and its half stones combine to form a whole stone which is absorbed into larger fields. With the renowned durability of interlocking pave stones, Holland Stone offers the old world charm of a simple paver shape. The rectangular shape can be installed in a number of fascinating patterns to produce simple or intricate designs. Mix these patterns with any of the available standard colors or combination of colors and you've got the potential for an architectural effect limited only by the imagination. Available Colors: Granite, Meriam Blend. 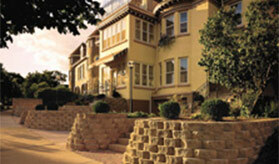 The CityStone series shares a common architectural look in which texture is defined by the joint pattern. The extensive range - from 4x4 to 24x24 - of CityStone shapes yields unlimited creative control to satisfy your design intent. CityStone's generous chamfers control lippage even in challenging large-format / non-planar installations, and units are available in a range of paver heights to suit a variety of traffic conditions and base preparations. Available Colors: Granite, Merriam Blend. 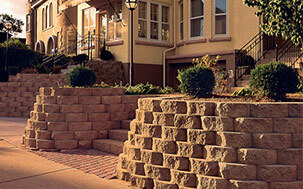 TThe CityStone series shares a common architectural look in which texture is defined by the joint pattern. The extensive range - from 4x4 to 24x24 - of CityStone shapes yields unlimited creative control to satisfy your design intent. CityStone's generous chamfers control lippage even in challenging large-format / non-planar installations, and units are available in a range of paver heights to suit a variety of traffic conditions and base preparations. 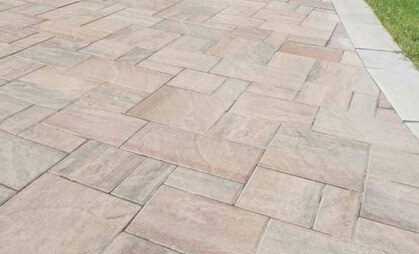 The Eco-Priora™ paver is produced with a patented interlocking joint and a micro-chamfered top edge profile. This ingenuity, combined with the size of the paver, is singular to Pavestone's permeable pavers and insures optimum pavement performance unequaled in the permeable paver industry. The unique Eco-Priora™ joint profile allows surface water to infiltrate into the pavement and its sub-layers. Available Colors: Eddington Blend, Hearthstone, Sand Blend, Trinity Blend. The premier Pavestone® product for vintage slate texture and timeless beauty, the Panorama Combo Series is a five-piece system used to create sophisticated courtyards, sidewalks, pool decks, garden paths, promenades and plazas. Available in three Panorama DemiCombo sizes and three Panorama SupraCombo sizes, the pavers are made from a no slump concrete mix, and average 8,000 PSI compressive strength and five percent or less absorption. Available Colors: Antique Red, Eddington, Winter Blend. The Plaza series features rounded surfaces and edges which recall the timeless appeal of stones worn smooth by glaciers. Designed for random runner, ashlar and decorative patterns, Plaza installs quickly and creates the aesthetic of historical Old World pavements. Plaza pavers are available in an extensive range of sizes and heights to suit a variety of traffic conditions and base preparations, and in layer arrangements to facilitate mechanical installation. Available Colors: Ashbury Haze, Aspen, Fossil Beige, Black Diamond. Available Colors: Ashbury Haze, Aspen Blend, Fossil Beige, Black Diamond. Available Colors: Brittany Beige, Ashbury Haze. Available Colors: Ashbury Haze, Aspen Blend, Brittany Beige, Rio. Available Colors: Aspen, Brittany Beige, Victorian Blend. Available Colors: Cotswold Mist, Danville Beige. Available Colors: Ashbury Haze, Aspen Blend, Brittany Beige, Victorian Blend. One of the most versatile pavers available, Moduline Series comes in a wide array of colors, sizes and shapes to use as an accent or border or to create unique contemporary designs. 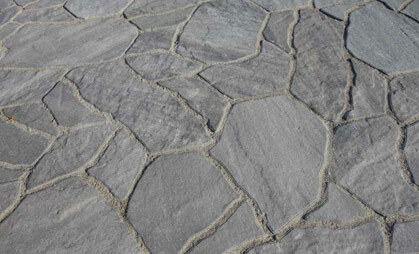 Ledge Rock adds a subtle surface texture to traditional cobble paving stones. By tumbling the stones the natural stone texture is accented. 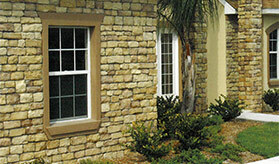 The results is the most natural looking shape offered in the Romanstone product line. Crafted Grand Lifestyle Pavers® and Lifestyle Pavers® will provide the utmost in beauty and durability to your project. Crafted with advanced technology, Grand Milestone™ and Milestone Pavers™ will provide the utmost in beauty and durability to your project. Crafted with advanced technology, Destination Pavers™ will provide the utmost in beauty and durability to your project. Color: Bavarian Blend, Copper Ridge, Steel Mountain. The long, clean lines of new Artline reflects an emerging trend to minmalist, modern outdoor designs. Look for Artline in an exclusive number of colors that can be used separately or combined together to create graphic interest. Color: Alpine Grey, Bavarian Blend, Sycamore, Granite Fusion, Opal. 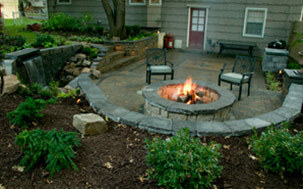 Beacon Hill Flagstone has a very natural apperance and is ideal for almost any landscape project you can imagine. 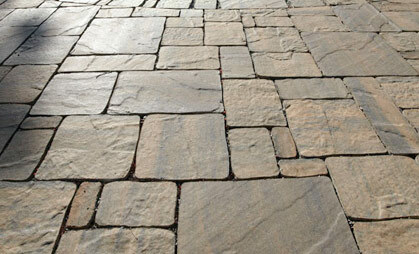 Its soft blended colors and subtle surface design gives Beacon Hill Flagstone that relaxed historic look and feel. Color: Coffee Creek, Limestone, Prairie, Sandstone, Sierra. 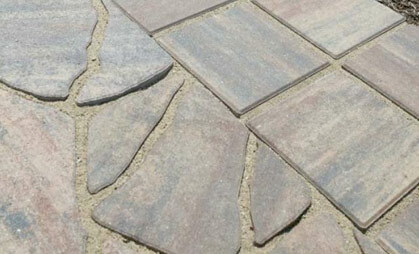 Introduced to North America by Unilock, Brussels Block is the original tumbled paver. Its timeless warmth, relaxed appearance and tumbled finish reflect the design cues of quarried stone. Color: Alpine Grey, Bavarian Blend, Sycamore. Brussels Premiere has all of the features and relaxed appearance of our time-tested Brussels Block with the added strength and durability of Unilock's exclusive EduraColor technology. Color: Basalt, Burgundy Red, Burnt Clay, Old Oak, Steel Blue. Reminiscent of the brick pavers used in old European cities, towns and villages, Copthorne is a virtually indestructible paver that will not split, crack or fade. Crafted using a special forming process, each piece is uniquely altered, yet the dimensions are consistant for easy, efficient installation. Color: Brown, Charleston, Granite, Heritage Brown, Sierra. Color: Dawn Mist, Pebble Taupe, Smoke Shale. Color: Golden Tan, Mineral Ice Grey, Mocha Brown, Onyx Black. A sophisticated paver with a high-performance surface made from a combination of granite and quartz aggregates. Perfect for residential or commercial driveways, walkways and patios. Color: Alpine Grey, Bavarian Brown, Sycamore. Color: French Grey, Harvest Brown, Midnight Sky, Summer Wheat, Winter Marvel. The random dispersion of color and granite particles creates the beauty of Umbriano’s unique mottled surface, which resembles the appearance of natural granite. Umbriano’s non-slip, stain-resistant surface is an ideal selection for driveways, pool decks, patios, commercial plazas and offices. Color: Burgundy Red, Burnt Clay, Old Oak. Color: Autumn Harvest, Stone Cliff Grey, Winter Mist, Black River, Hearthstone. The Unilock® commitment to quality and lifetime guarantee, now extends to an impressive array of premium Natural Stone from Europe and Asia. Natural Stone from Unilock features low water absorption, excellent freeze-thaw durability and flexural strength. Precisely cut and calibrated, the stone’s natural beauty is enhanced with a variety of surface treatments. Color: Basalt, Belgian Blue, Dawn Mist, Pebble Taupe. Available Colors: Azzurro, Baja Beige, Rock Garden Brown. Available Colors: Champlain Grey, Shale Grey. You can hear the echo of the craftsman’s tools in Blu. The same honest lines and rugged texture as our larger, 80mm version, the same opulent colors and modern yet eternal look, Blu 60mm is lighter in weight and has a smaller height, making it a better choice for pedestrian and light-traffic-only areas such as on walkways and patios. Blu 60 Smooth is part of the dry cast collection. You can hear the echo of the craftsman’s tools in Blu. The same honest lines and rugged texture as our larger, 80mm version, the same opulent colors and modern yet eternal look, Blu 60mm is lighter in weight and has a smaller height, making it a better choice for pedestrian and light-traffic-only areas such as on walkways and patios. Blu grande is part of the dry cast collection. A wood-like finish beautifully replicating the variable nature of the material they so elegantly emulate. The indoor warmth and rich look of hardwood flooring is now available outdoors. The modular 5” and 10” wide slabs are being called the trompe-l’oeil by industry professionals; it will have you guessing whether it’s hardwood or concrete. Borealis looks and feels like wood planks, is offered in three alluring colors and is great for adding drama through creative bandings and designs. Whether it’s your poolside, deck, or patio, Borealis brings the appealing esthetics of wood to your backyard. Borealis is part of the wet cast collection. Available Colors: Ivory, Riviera, Rock Garden Brown. The Travertina Raw mimics the texture of natural travertine in a concrete material. This product line has enjoyed huge success and has now been improved with an ultra robust mix design, making it far more durable than the natural alternative. This is a perfect solution for use in winter climates. Techo-Bloc has now extended the collection to a double-sided, structural retaining wall system, two wall caps and pool coping in order to fulfill customer demand for this luxurious product. Travertina is part of the wet cast collection. Available Colors: Chestnut Brown, Chocolate Brown, Onyx Black, Sandlewood, Shale Grey. Give your backyard the allure of cobblestone courtyards with this paver, perfect for the decorative aspects of your dream landscape. Need landscaping ideas? The Antika paver’s unique shapes reduce the need for cutting and makes for an easy installation process. The free-flowing dimensions and manageable disposition of this paver allows for creativity in design and helps with the pavement of narrow and oddly-shaped spaces in your backyard. Great for patios, driveways, pool decks, walkways, as well as framing and dividing outdoor living spaces with custom mosaics. Vehicular & pedestrian friendly. This pavement is also de-icing salt resistant, withstands harsh climates and comes with a transferable lifetime warranty. The Antika paver can also be installed using a Permeable pavement application. Antika is part of the dry cast collection.